In 1763 France and England signed the Treaty of Paris and Canada became a British possession. Sixty years later the mother country had made no effort to provide an official currency for the young colony. By this time several private banks were in operation and they issued paper money which served to facilitate large business transactions. It was in the market place, where the ordinary citizen had to make change for small purchases, that the situation was most keenly felt. The metallic currency in circulation consisted mainly of British and foreign coins (French, Spanish, Dutch, Portuguese and American), many so worn as to be almost unidentifiable. At this time several banks and a number of merchants began to issue copper tokens to meet the need for small change. One of these firms was Thos. and Wm. Molson of Montreal, brewers, distillers, shipbuilders and philanthropists. 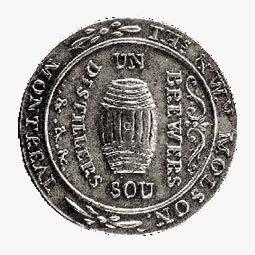 Their well-designed token bore the denomination of Un Sou and was dated 1837. Twenty years later, this family founded the Molson's Bank which became one of Canada's largest chartered banks and continued to operate until 1925, when it was absorbed by the Bank of Montreal. The token illustrated is part of the National Currency Collection, Bank of Canada.